The company announces an automated process by which its customers will be refunded. By 31 October, Google expects advertisers and agencies will have done their 50% of the heavy lifting in the fight against ad fraud and ad budget wastage. The company has announced a tangible step toward identifying and preventing invalid traffic on DoubleClick. Responding to concerns from advertisers and agencies that have lost ad spending to fraud on the DoubleClick Bid Manager platform, Google intends to automate a process by which its customers will be refunded. For up to 30 days after monthly billing, the search and tech giant says it will refund advertisers and agencies for any invalid traffic that has been detected for inventory purchased through ad partners such as AppNexus, Index Exchange, OpenX, Teads, Telaria, and Google's own DoubleClick Ad Exchange. Advertisers and agencies will be able to identify the supply partners that have agreed to refund ad budgets that went to invalid traffic, going further to include an option that will limit ad spending toward those supply partners. According to an announcement post by Payam Shodjai, the director of product management at Google, the decision to do this is part of a series of gestures to increase transparency in the advertising supply chain. It also allows Google to give advertisers more information about the invalid traffic detected in their media campaigns. "Supply partners will receive reporting on the sources and amounts of invalid traffic that our systems are post-serve filtering from their platforms," Shodjai wrote. The Authorized Digital Sellers standard launched by the Interactive Advertising Bureau in May 2017 was created in partnership with Google in order to truncate spoofing and reselling in the open marketplace. Commonly known as ads.txt, the standard involves a text file that resides on an advertiser's web server and informs it of the best programmatic inventory seller. It creates an authentication exchange that retrenches fraudulent inventory from being bought and sold. 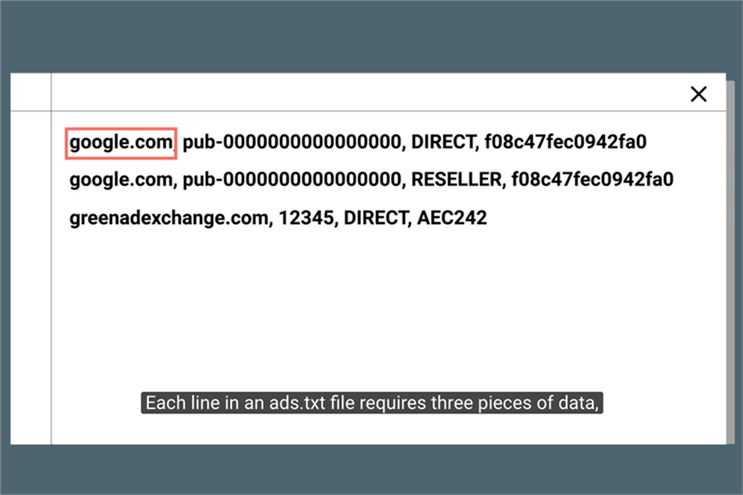 The ads.txt standard, which requires certification for suppliers, is part of a push towards proliferating transparency and extinguishing fraud. Now it is up to the advertisers and agencies to ensure the ads.txt file is implemented on the campaign domain. For its part, Google expects that by 31 October, the DoubleClick Bid Manager will start buying publisher inventory based on the authentication occurring by the ads.txt files on the sites of advertisers. Is Blockchain the answer to ad fraud?